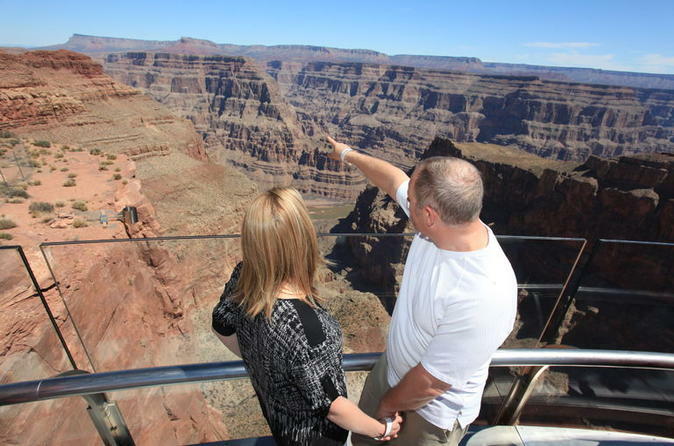 Take a deluxe helicopter tour from Las Vegas to the Grand Canyon West Rim. At the Grand Canyon, you'll have time to explore its beauty on your own and then take an optional helicopter tour down to a private bluff in the canyon. At the West Rim, you'll also have the option to walk on the Skywalk, a glass-bottom walkway that extends out over the edge of the Grand Canyon. Your excursion from Las Vegas to the Grand Canyon begins with a scenic helicopter flight over Lake Mead, Hoover Dam, Fortification Hill and Temple Rock. Fly through the majestic Grand Canyon as you head towards your primary destination, the Grand Canyon West Rim. Upon landing, you will have approximately 3.5 hours to explore and take in the various overlooks and highlights of Grand Canyon West Rim. Enjoy a meal at the viewpoint of your choice. You'll visit Eagle Point, home to the Skywalk. Upgrade and add the Skywalk onto your tour. The Skywalk is a glass-bottom walking surface that suspends more than 4,000 feet (1219m) above the Grand Canyon and extends more than 70 feet (21m) out from the edge. At Guano Point, visit Highpoint Hike, where you'll see breathtaking panoramic views of the Grand Canyon and Colorado River. Also see remnants of a historic tram that stretched 8,800 feet (2682m) across the canyon to a guano mine discovered in the 1930s. Visit the Hualapai Ranch where you can go horseback riding. Choose from several horseback riding options, including a 30-minute trail ride that takes you to the canyon rim or an arena ride (additional fee). Also at the ranch there is cowboy entertainment, wagon rides, roping demonstrations and more. Finally, if you select the helicopter upgrade option, you’ll fly down to a private bluff at the bottom of the Grand Canyon. You'll descend and land 3,500 feet (1066m) below the rim where you will enjoy the mystique and grandeur of the Grand Canyon from an exclusive landing site only 300 feet (91 meters) above the mighty Colorado River. Enjoy this breathtaking setting and make sure to bring your camera for one-of-a-kind photo opportunities. The activity lasts approximately 40 minutes and features 20 minutes at the bottom of the canyon.